Keys Joins Companies for Safer Chemicals to Change US Government Thinking! Keys was a very early company joining the EWG Skin Deep database creation and the subsequent efforts to have the world recognize that many chemicals in our everyday life are the cause of many skin disorder. 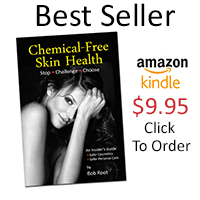 Our founder, Bob Root, wrote the book, “Chemical-Free Skin Health,” to also emphasize the point helping to have Keys honored by the Campaign for Safe Cosmetics as a Champion company. Our work with the Environmental Media Association in Hollywood and now Companies for Safer Chemicals is a further expression of our desire and effort to change the way people, companies and the government think about what goes on to our bodies. Bob is our representative on the Companies for Safer Chemicals committee and will help to spearhead our thinking within the group. Below is the press release sent out today. WASHINGTON, DC (December 12, 2013) –A group of the country’s leading consumer brands announced the formation of a new coalition to press Congress to modernize the nation’s out-of-date and ineffective chemical safety laws. Strong lobbying by other industry groups has given policymakers the impression that business is monolithic in its support for weak legislation. The new coalition, Companies for Safer Chemicals, will make a business argument for strong reforms that support the industry innovating safer and cleaner products. The founding members of the coalition, led by Seventh Generation and the American Sustainable Business Council, include Patagonia, Stonyfield Farm, Aubrey Organics, Method, Naturepedic, Badger, Annie’s, EILEEN FISHER, Zarbee’s Naturals, Keys, Think Dirty, Beautycounter and others. As companies and business leaders we’re asking Congress to pass comprehensive and effective chemical safety reform legislation now. Chemical policy reform must protect the most vulnerable among us, and require public access to information regarding the safety of chemicals. Reform must respect the rights of states to protect their residents when the federal government fails to do so, and require the Environmental Protection Agency to take fast action on the most harmful chemicals. Right now the Chemical Safety Improvement Act does NOT meet these criteria. Guided by good science, legislation can drive business innovation and success, and protect public health. The Toxic Substances Control Act (TSCA) was passed in 1976, and unlike other major environmental laws, has never been updated. As a result, it is a barrier to industry innovation as well as a hindrance to the health of employees and consumers. The U.S. Senate has introduced the Chemical Safety Improvement Act and the House of Representatives is expected to draft its own legislation. The principles laid out in the declaration will guide the coalition’s educational and advocacy activities to shape developing legislation. “We would like to see regulations that promote transparency and support the public’s right to know what is in the products that they buy. That’s why we have joined this coalition of businesses to advocate for reform,” said Adam Lowry, Co-founder of Method. “We believe it’s important to join forces with like-minded companies who support using safe chemicals for making all kinds of consumer products, including beauty and personal care. By becoming part of the coalition to campaign for tighter regulations, we amplify the educational and awareness efforts of our mobile app. And we hope through our involvement, we will inspire younger users to pay attention to this urgent public health issue,” said Lily Tse, CEO and Founder of Think Dirty.